We all have different needs due to the platform and/or stack we work with, and simple programmer preference is famous for starting religious wars. However, in each area there is usually a set of tools that get recommended over and over, even though people might individually prefer one member over the others. Unix text mode code editors, for example, is an extremely contentious issue but no one can deny that most people will choose either vi or emacs. So, without criticising the alternatives, recommend me developement tools. Text editors for different platforms, version control systems, bug trackers, database engines, templating systems... whatever! What do you enjoy using every day? The Scott Hanselman's 2007 Ultimate Developer and Power Users Tool List for Windows  may give you some ideas. I just copy over all the files into C:\Program Files\Bin, then add that to my PATH. The only must have is version control and file backup It doesn't really matter which version control you use as long as you have some way to track what changes have been made to the system. I could probably not live without WinMerge  on Windows. It is a GUI diff/merging program that can generate standard unified diff patches. It also has a couple of cool plugins that let you diff zip files and MS Office documents. Seriously, the guys who put Hudson together did a great job. It's a single WAR (Java Web ARchive) file that contains an embedded web server and allows you to setup a continuous build server with a single command. The web interface is great with good feedback through the use of AJAX. This thing puts a smile on developers' faces when I show it to them. It's that good. The best issue tracking tool I've used in 15 years. Developers and managers like it. Web-based with a clean interface. Not going to list a ton of sites but just going to go with the suggestion of The Internet. And, really, that one applies to most things in modern life and not just software development. I find TestDriven.NET  indispensable when unit testing with .NET. It's by far the best test running tool I've used. It's great when you just need to run a single test in the VS debugger. Just right click on the method in the IDE and choose " Test with -> debugger ". For Java, there are loads of great tools for development. 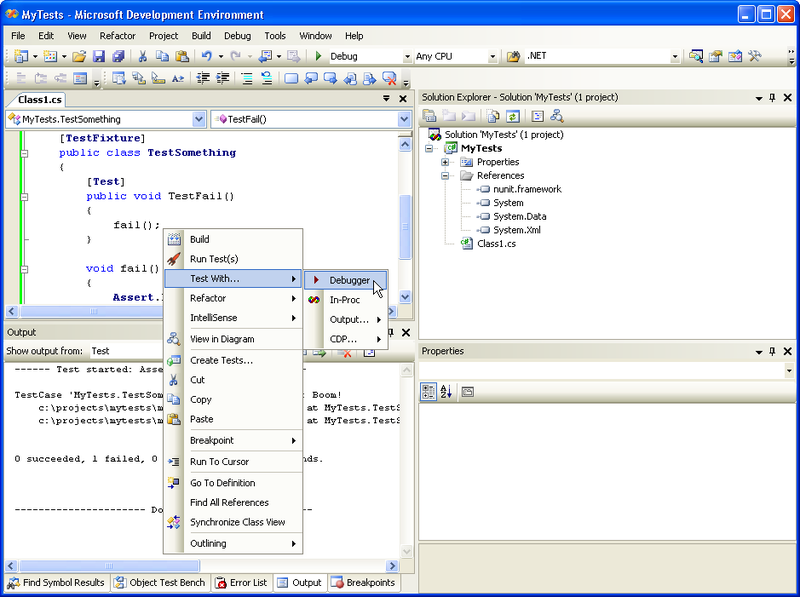 There are two great IDEs for Java: Eclipse , and Sun's NetBeans . Both tools are particularly hot for doing J2EE development, since they can set up and run your tomcat and glassfish servers and manage deployment. I'v never managed to get TDD going for myself, but I think a lot of people will like JUnit . One thing I don't like in most IDEs is their XML support. For that I use the Exchanger  XML editor. It's a pity it hasn't been updated in a while. There is, imo, no excuse for not having some sort of version management. Currently, I use Subversion. On OSX, I really like Version , and windows has unparalleled integration with TortoiseSVN . Virtual Machines can make a big difference to testing stuff, since they can let you break things or set up distributed systems locally. We use Xen  for our servers, and I am trying Virtualbox  for local testing on my mac. Finally, I'd say that the GNU utils (grep, tail, pipe, sort, etc) are indispensable for diagnosing problems. I'd recommend looking at things like cygwin  or the windows powershell to try and get them if you're in windows. NUnit  for .NET Unit Test Cases. NAnt  for .NET automated builds. Will update the post as soon as I can think of other required tools! Meld  is a great tool that I've been enjoying recently. If you're coding with Visual Studio, Visual Assist X  is one of the best addons you could ever find. Procexp and Procmon  are critical sysinternals tools for diagnosing tricky configuration problems with assemblies, dlls, registry entries, and the file system. If you are a windows dev and the sysinternal tools are not part of your toolbox and you are cheating yourself. Fxcop  for managed code and Prefast  for VC++ code (particularly with SAL annotations) are incredibly helpful for setting a standard code quality bar and keeping it across a team. If your app requires it this can be critical for writing secure code. VMware and Hyper-V are incredibly useful for setting up and isolating difficult bugs. Obviously the VS debugger (disclosure .. I worked on the vs debugger). With the VS debugger there are data visualizers that can be incredibly helpful for specifc tasks. Josh Smith's "Mole"  for debugging WPF is a good example and I believe there is a 3rd party visualizer for datasets that is much better then the default one. For deep debugging of the clr you need to use SOS , which has support in VS, but is often used from windbg. For trapping production problems and debugging offline you should implement minidump support  in your app. Some Mac Applications for Web Development. If there is no $/€ amount listed assume the application is free. My "must haves" are always the top listed one in the group (with the exception of Coda because I haven't purchased it so I don't know). The rest listed are all other very popular applications used by others. There are a number of SVN clients but most of the good ones are in beta/pre-release, and the free ones are easy to find. As always you can use the Command Line for any of these. As a web Developer you should be able to test with all the popular browsers. Gosh, I know I missed a bunch but I think this is a good foundation for listing applications. To go along with this you really need links to documentation websites, etc. but that is really outside the bounds of the question. I hope you bought a mac! Grab the book for the details. Regular Expression generator  which generates regular expressions from any text you type in. Instruments is my favourite programming tool! Even when working all day long in Visual Studio, emacs is a must-have, if for no other reason than its macros. To help with traversing through code in a command line environment ctags and cscope make life a lot easier. One or more large whiteboards and camera to snapshot ideas before you move on to the next. As my main text editor, I love TextPad  but it costs a little and doesn't have proper Unicode support. Notepad++ is a good and portable alternative. I use Notepad2  to open single text files because it's very fast and Unicode-smart. Aptana  is quite wonderful for all your web development needs - and is available on Linux too. Especially good if you find code auto-completion useful or are used to Eclipse. Use Firefox and learn to use Firebug . It will make your web development life so much easier. Oh, and don't forget to get Firebug Lite  as a bookmarklet for getting some of those features with IE, Opera, etc. Install the Web Developer  extension too which has useful "view cookies", "CSS off", "images off" features etc. To manage your own development, I like DevProject Manager . Others have covered source control in detail elsewhere on this page, but I like Subversion . A good diff utility is vital, especially for managing releases across servers. WinMerge  is great and is available as a Portable App. The best thing about it is that you can navigate directories for changes (like Windows Explorer with diffs visible for all the files - changed/same/new). Filezilla  is a good and portable FTP client, or you could try the FireFTP  Firefox extension. Eclipse for development in PHP, Java, or other popular more open languages. There are lots of great plugins and configurations you can set to make it just right for your liking. Winmerge for File diffs. I find this tool to be one of the best Open Source apps I've ever used. It's very well polished and makes it easy to view differences on files. Notepad2 for just simple file editing on Windows. I find it to be a good replacement for Notepad that comes with Windows. It includes syntax highlighting for many languages, along with other neat features that make it great for a lightweight text editor. Git  for version control. Works great by itself, or as a svn client with git-svn. Unlocker  - must have Explorer extension. They are not necessarily the best in their fields, but as they say: "pick one tool, take the time to learn it, and squeeze it". The C++Builder IDE from Codegear  gives me such a great head-start on developing Windows GUI applications that I'm almost unwilling to recommend it in case my competitors catch on. It's not perfect, but the combination of C++, two-way visual RAD design, a well tried and tested application framework (VCL) and slews of third-party components (basically, all Delphi components since ~1995) hit a sweet spot for me. Otherwise, +1 for for the usual suspects: SVN, TortoiseSVN, Fogbugz, Winmerge. Two apps I use frequently are..
MZ Tools and Smart Indenter for Excel development...even if it's not a "proper" language it's nice to write nice code in it! SQL Prompt from Red-Gate. Man I love that thing. Fiddler 2. A must for web development. What development do you do? Do you need some design tools? What is your system configuration? A good launcher - I use Launchy  Make sure you get the Weby plugin as well. Code snippet editor for VS (obv if you dev in VS) I use Snippy . Good notepad, I personally use Editra . Paint.NET  - Its awesome, donate if you like it! A Sync tool for all the odd files that you like to keep with you (supporting shortcuts for Launchy etc.. I actually use Live Mesh . When programming in python I live in ipython  and am constantly testing things out next to my editor. When programming in Java beanshell  gets plenty of use. When I write PHP I miss having an easy shell to work in. Edit, save, run, debug, edit takes a lot longer. I write code in Perl and C.
vim - I try to never use the mouse. Some prefer Emacs. It's a matter of tradition for me. I typically use vim when I want to focus on a task that I'm familiar with. 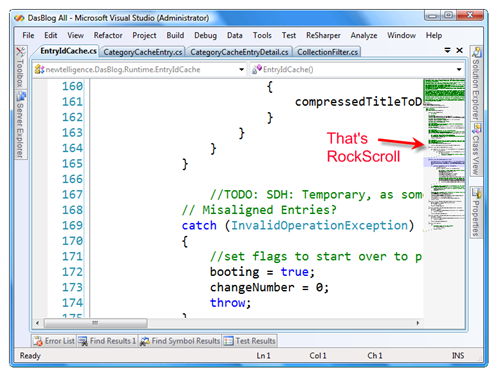 I use Visual Studio when I absolutely need the context-completion and object-browsing. MS VS2005 - Microsoft has the best context-completion and object-browsing I've ever used. Viemu - Sometimes I want vim in visual studio- this is the only tool I know of that provides this capability. However, I've realized that one of the reasons I use vim is to decrease the amount of screen clutter. Viemu doesn't help with that much. kdiff3 - I don't know how I'd survive without a decent merging and diffing tool. This does the job reasonably well. It's gui-based but you can construct merges using keyboard shortcuts. That's a boon. MediaWiki - If it's not in the source code, we use a wiki. This is a good solution for non-deliverable document control. Trac - for small shops, this integrates bug tracking and revision control reasonable well. Subversion - Very well supported in the industry. Almost as ubiquitous as CVS. The only feature it's missing is merge-tracking. I understand that's a feature planned for a future version. I figured that since there are lots of good answers here that I would make my own answer, mark it as The Answer, and edit it up with everyones suggestions. All fine except I can't accept my own answer... Not really sure what to do about that. We actually use www.unfuddle.com  for our subversion reposity. We are a small team working from 2 different locations. These are the tools I use every day. Expresso is good but RegexBuddy is much more usable. Thanks, a lot of nice tools listed here. Time to try some of them. Here are what I use currently. NDepend : It is a static code analyzer that will let you explore your code base, and write quality and design rules. One tool that I always miss on Windows is a good window manager. I suppose this is one reason why Windows (and Mac) developers tend to like IDEs better than old Unix folks. On Linux I prefer Blackbox -- it's features fit my work style, and it tends to stay out of my way. My recommendations aren't specifically programming tools, but they help organize my workspace while I'm getting things done. WinSplit Revolution  -- I like to be able to quickly maximize, tile, and organize my windows with a quick keystroke or two. I threw together a little script to do the same thing in Linux because I could find nothing like it. I can't stand working for long on computers that don't have something like this now. VirtuaWin  -- Virtual desktops for Windows that actually work half-decently. Not an incredibly slow piece of junk like Microsoft's official powertoy. Launchy  -- Launch programs via keyboard. I use Gnome Do  on Linux, but it's not as good. For development process tools we use some of the Atlassian products (FishEye repository browsing, Crucible peer reviewing tool, Confluence wiki) and Hudson - which (echoing sentiments above) is on of the greatest development aids I have ever used. JIRA is the best issue management tool I have ever used, but am still a fan of XPlanner in certain cases. The more they integrate the better. I use the Eclipse IDE for Java development with the Subclipse plug-in for revision control of group projects and SVN as the actual revision control program. For C/C++ and python development on Linux I prefer to use gedit. For Ruby development on any platform and C/C++ and Python development on Windows, I prefer to use Scite. When I am learning algorithms / data structures / programming there are two tools, which are invaluable to me - Microsoft Excel and Idle (Python GUI). You may laugh - but proving simple things in Excel and using Idle as pimped calculator really speeds my learning process. Wireshark  when you need to know what is actually on the wire. Lots of filtering options and support for a large number of protocols. I've dropped all the eye candy. I've decided to rough it for a while. I don't see many Unix-platform Development tools here besides the standard vim, emacs, shell utilities, versioning, etc. quilt -- While DVCS is really important, patching has another niche altogether. With quilt, you can easily maintain a series of patches, letting it automatically keep track of the changes you've made and diff them, and later let you roll-back or roll-ahead, and all you need to do to get the changes to someone else is give them the patch-files! qemu -- A really powerful virtual machine. One really beautiful thing about it is the --nographic option, which lets you run a virtual machine in just text! guake -- Just an example, though there are other Quake-style terminals that drop down and really let you get to the command-line and back from GUI really quickly. xchat -- No, really. Almost any open-source project has dev's on an IRC, and the easiest way to find something out is to ping them! Code::Blocks  Great cross-platform IDE, could use plugin updates but is very extendable. Can come with MinGW but works with many compilers. SourceForge  Uh,.. It's source forge. I second StackOverflow, it's StackOverflow. and google. SciTE  easily works with many languages, cross-platform, opensource, condensed IDE that you can easily add anything at all too or quickly edit. FLTK  with FLUID. "Fast, light toolkit" for cross-platform GUI, FLUID for making a GUI quickly. C++ library. A separate partition or external drive for dev. Hexdecimal calculator, ASCII tables, other boring things. Vim - no matter how many IDEs companies make me try and use I still wind up cutting all the code in Vim and only using the IDE to manage the compilation. Vim is very nice, very scriptable and a charm to use remotely. iTerm on Mac, Gnome-Terminal on Linux Any terminal with tabs that lets me configure shift-left and shift-right to be next and previous tab. The number of times that's helped me rapidly switch back and forward between two pieces of code or code and output to diagnose problems. I am still looking for a decent Windows terminal app. Emacs - I used to be an Emacs boy but changed to Vim recently. Matter of preference but all the same pros as Vim, different syntax and keyboard shortcuts. Good to know both editors in case you get stuck with one of them. Redmine (http://redmine.org) - I love this tool. SVN/GIT/Bazzar/Mercurial integration, ticket tracker, wiki, workflow all rolled into one pretty tight tool. Decent Diff/Merge tool. I was spoiled by the tool in ClearCase when for code review/merge. I haven't found a tool quite as useable (or as ugly) since. Good reference book for your language(s) of choice - no matter how many online resources there are I can guarantee that the Net will be down at 10 minutes to crunch time and you need to look up some obscure language feature in a hurry. The 1st step to design the web page is to design layout. The layout generators  will save your time. LLBLGen for code generation, it is brilliant. Cygwin or, if in Vista Ultimate, the Unix Subsystem. Mostly for the purpose of having access to grep. Here's what I use daily for console development on a windows machine. For PHP development, I use NuSphere PhpED . Everything is built, deployed and tested upon every checkin! multiple (aka virtual) desktops - truly indispensable for me. I like to keep a lot of windows open, and find it much easier to spatially organise them than have to Alt-Tab through fifteen things to get to a particular window. Most *nix WMs do these; for Windows, others have pointed out VirtuaWin , which is lightweight, configurable and works pretty well. Agent Ransack is a tool I use for searching many files for contents in Windows. It is fast, and powerful. I'm mostly developing on FreeBSD but use Mac OS X as my main desktop so I use TextMate  for text editing and various UNIX utilities coming from MacPorts . I use Fusion  for creating & managing FreeBSD VMs. My version control system of choice is Mercurial , a decentralized vcs. Scripting is done in Ruby . Being a Ruby fan, I'd recommend Redmine  for bug tracking/releasing/forge. It is evolving quite rapidly and has the same feature set as Trac. When Developing software for Linux I discovered something shocking: There is no such thing as "Essential" tool. you can write code using simple text editor and debug the program by writing logs. And your understanding of the program would probably increase. However since most of use need to maximize our output in order to create value to our companies every tool that its cost is less then the time it saves should be considered essential. I also use Sun's VirtualBox for having different developer setups (java, .NET) without cramming everything into one. Shameless self plug: I also find my own RefactorBuddy  invaluable. And without reservation, ProGuard  Java code obfuscator/shrinker. As I do all my programming these days as just noodling around, I only use Squeak for stuff, and if I need to achieve anything it will usually involve cygwin commandline tools or Xemacs for text processing. A sensible alternative for all of those might be something like bigloo + xemacs. Best Regular Expression Editor I know for Windows is Expresso . It has a designer and even more important, an automated analyzer, that can easily be used for documentation of complex regexp snytax. For merging I also use SourceGear DiffMerge . And the rest of the tools includes a good Text Editor and a good IDE. I'd say something like VMWare or Virtual PC would be a good start. Although it isn't as fast as raw hardware you'll gain time when you want to start clean or when you want to try out something new. Also switching between projects with different tools (versions of visual studio, source control, frameworks, factories & generators) is much faster! I'm very happy with Subversion + Trac for integrated source code control, repository browser, issue tracker and wiki. I run it on an Apache web server which also provides the authentication mechanism. Trac is very easy to set up and use. MySQL Workbench is pretty amazing. It's a way to set up your tables/and stuff visually, produce pretty charts to tape to your wall, and it has a nice export tool, for full create scripts, and will also read previous exports to create an ALTER script based on Diffs. I am a huge fan of Powershell . Don't be fooled by the administrator tools credentials, if you do development in .Net or want a OO scripting language on your Windows box that puts the UNIX equivalents to shame, this is it. I also use GVim  and Notepad++  on a daily basis. I personally just bought a copy of SlickEdit . Great editor (vim emulation + integrated IDE features = yes please! ), expensive, can be kinda clunky. Beyond Compare  is a great diff tool. As far as version control, I like Git , but SVN  is great and widespread. I need a good shell, and fish  is my favourite. File/Folder comparison: Beyond Compare  (not free). I used WinMerge years ago but it didn't have folder comparisons at the time. Visual studio is essentially an incomplete product without it. I cannont stess this enough. It was essentially forced upon me by my job, but now I adore it. It's my first stop for Java/JSP/JSF work (it can also do PHP with a plugin). The zero-configuration embedded application server is also quite awesome. Also, another vote for Beyond Compare . I just discovered it a few weeks ago when Jeff Atwood blogged about it. WinMerge  for diff/merge and TortoiseSVN  for CM are the first things I install after Eclipse. Beyond Compare is essential for comparisons of files, folders local or remote (ftp). It is awesome! In practice I don't see how you could really use all of those tools well. Here is a pared down list of what I use in my 2 separate development environments since I split my time roughly in half between C# and Python. About half of these tools are free. I also use UltraEdit-32 from IDM Computer Solutions. It is not as good for multi-language development, but it supports editing files accessible with FTP. UNIX/Linux remote sessions: puTTY is an excellent free program for this. I am a big fan of xplorer2 , it makes navigating the file system more programmer friendly. I am sure everyone will agree that using the search capability in Windows XP is infuriating; Xplorer2 allows you to search across directories and inside files, although not quite grep it is very useful. It comes with a nice lightweight replacement of notepad. Eclipse PDT for PHP development on Linux. Of the tools I have seen on the list that haven't been mentioned one of my favorites is "Dave's Quick Search Deskbar" which can be found at http://dqsd.net/ it's ability to use switched shortcuts for things like MSDN and the MS Knowledgebase Q articles are outstanding. There are probably 30 of the shortcuts I use constantly when programming and well over 200 odd searches ranging from FedEx Tracking number search. In addition to many of the above, I'm a big fan of MaxiVista . I use it with two laptops each with an external monitor, and uses it in two scenarios: 1. Extending the screen so that I can use four monitors simultaneously, or 2. Control the secondary computer with the same keyboard/mouse as I use on my primary computer just by moving the cursor over to the next monitor. While programming I use snagit and evernote. Evernote  is a great notepad program that creates a continuous tape of just about anything. I paste code into it all the time. It has a nice little search filter. It is pretty cool to grab a copy of the website you are developing each time you change it. Great way to show changes without much work. I'd second IntelliJ IDEA as a Java IDE. I keep on trying others but going back to IDEA. Built in refactoring, almost psychic code completion, good debugging, good integration with almost every popular tool, and usability which has clearly been thought about. GVim  - I've tried to use other editors and larger IDEs and such, and keep coming back to good old gvim. Slick Edit Gadgets  are a great addon to VS...I particularly like the line count. And they are free! The full versions I nice too, but may not be worth the cost for everyone. VSWindowManager  is a great tool for keeping window "Profiles" in Visual Studio. I use it all the time for switching between full window text editing and the usual window with Solution Explorer, Errors, Output, etc. VisualSVN  For VS Subversion integration...if you use VS and work in a subversion environment, this is hands down the best $50 you can spend. The time and sanity saved is worth every penny. I even bought it for work myself because they were too cheap to get it for me...I like it that much. I have found Copernic  to be much better than Windows Live Search, even under Vista. If you have > 1 monitor, then Ultramon  is indispensable. In Firefox, Mouse Gestures .